The HardiePlank siding has arrived! To copy the look of the original house, we are installing a water table with lap siding below and shingles above. 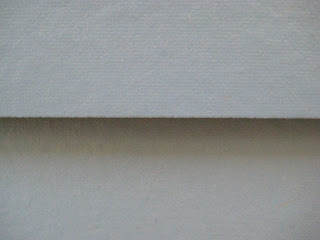 The HardiePlank Lap Siding is 5/16" thick, comes in 12' lengths, and has about a 6 week lead time. We went with the Smooth texture and 5" exposure in Boothbay Blue. Smooth was an easy choice after seeing the ultra cheesy fake wood texture of their Select Cedarmill option. Ugh! The shingles are HardieShingle Straight Edge Notched Panels, which are not actually individual shingles at all, but are 4' long fiber cement panels which are notched to look like 6", 8", and 12" wide shingles with a 7" high exposure. They have a subtle vertical wood grain that makes them look more like their cedar brethren. 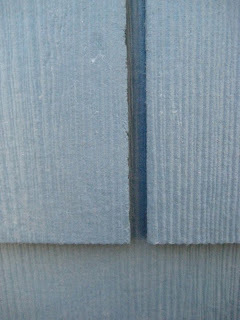 For those of you who haven't heard of James Hardie products, they are basically wood look-alikes made of fiber cement. They make lap siding, vertical siding, shingles, exterior trim, and soffit boards. They are also well known for their HardieBacker tile backer board. This is my first home remodel using the siding products, but so far so good! 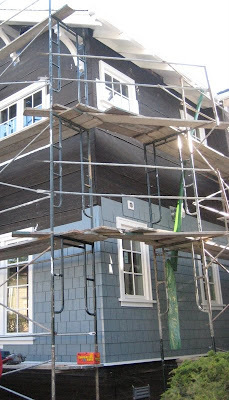 The pros are easy: No trees were harmed in the making of this siding. Won't curl, crack, or split like wood. HardieShingles have 30 year warranty, ColorPlus finish has a 15 year warranty, and the integral color means you don't have to pay for paint. Fiber cement is non-combustible so the whole house is much more fire resistant, termites are not interested, nor are fungi so dry rot is not an issue. The cost is close to cedar shingles, and when you take into account the savings on paint, it's a great value. The cons: The dust is ridiculously toxic, respirators and vacuum hook-ups are a must to avoid lung damage when cutting. Cutting requires a specialized (read: expensive) blade. Cedar brown shingle homes have a warmth and architectural familiarity that these can't duplicate -- the notches are just too perfect, the panels too flat. All in all though, I think that's a small price to pay to have siding that's virtually indestructible, green, and low maintenance. We were happy to come across your blog today and are excited about your very first James Hardie siding project! We would love to share your building journey on our Facebook page, www.facebook.com/jameshardieBP. If you can email us at onlineoutreach@jameshardie.com with a few details about your project we would be happy to share your story with our fans. I've been a big fan of cementicious fiber board for a while. It seems you have had some succes using it in a shakes application. Have you worked with it as a Board and Batten type cladding? Thanks for your note. I haven't used the fiber cement board and batten type cladding, but I just proposed it as a alternate to wood siding on a new house in Sonoma. If we get the project, I'll document it here. It will be a spring start, so stay tuned. Another great consideration is its light weight compared to something like stucco. Lighter is always better in seismic country. I agree...it's a great product.